I rarely endorse businesses on any of my websites, but some places are so extraordinary they deserve a mention. 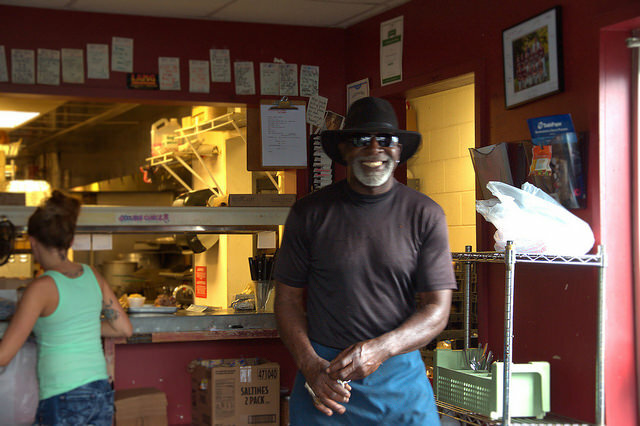 One such place is the unlikely St. Simons landmark, Southern Soul Barbeque. 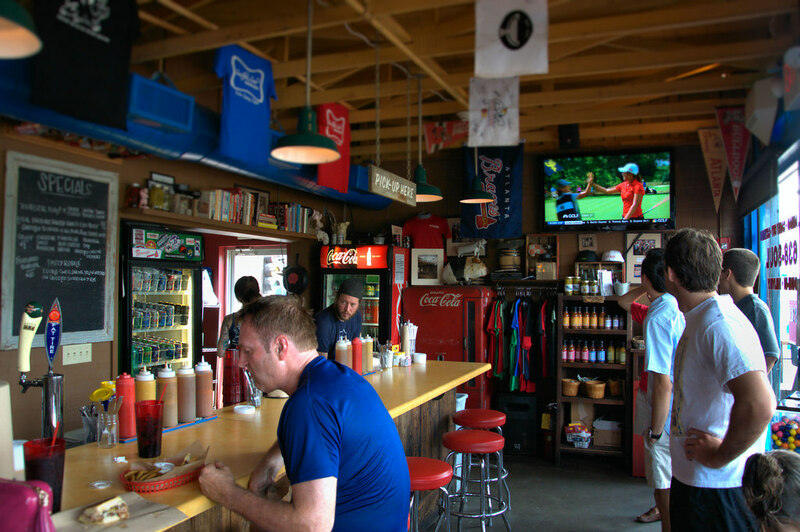 You might have read about it in Garden & Gun, Southern Living, or The New York Times, or seen it on the Travel Channel, or the popular Food Network show, Diners, Drive-Ins & Dives. But none of those outlets can compare to a visit in the flesh. 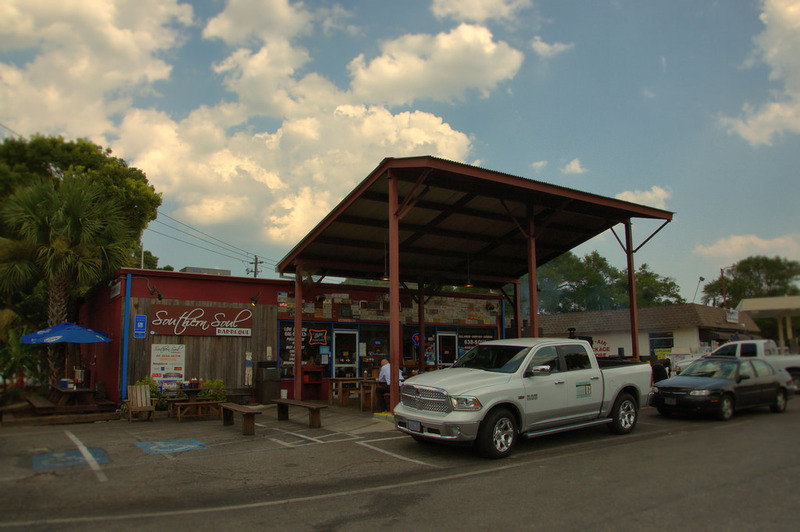 Owners Griffin Bufkin and Harrison Sapp transformed this 1940s gas station into a mecca for barbeque and soul food lovers and their fans are legion. There’s a great beer selection and a good variety of sauces for different tastes. (I prefer the mustard/vinegar-based Carolina style sauces, none of the sweet stuff for me). Everyone probably has his own favorite dish. Mine is the first meal I ever ate here. 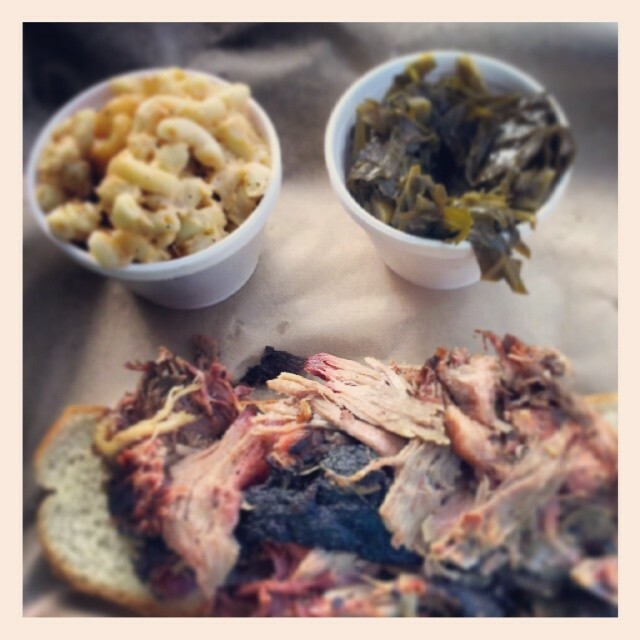 The pulled pork with mac & cheese and collard greens was truly heaven on a plate. The white bread was a fitting accompaniment to this holy trinity of Southern cuisine. You know it’s going to be good when the employees who work in the heat and smoke all day still have smiles on their faces. 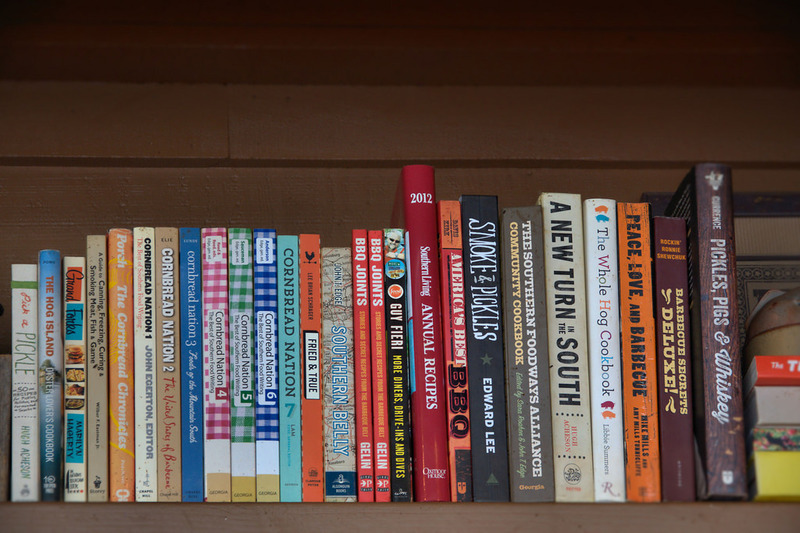 Books like the Southern Foodways Alliance’s classic series, Cornbread Nation, take up shelf space with modern culinary classics ranging from The Whole Hog Cookbook and Southern Belly to Pickles, Pigs & Whiskey and Smoke and Pickles. As a reader and book collector, I was amazed! Hi! I just saw your post about Southern Soul. I hope it is okay for me to share it on my face book page. Are you still on the Island? I follow your blog. Iâm very envious of your opportunity to capture the beautiful architecture of our State. Iâm writhing because I wanted to know if you have photographed the old house on Demere Road. I have been meaning to ask you after I saw that you were here at an earlier date and the house was not included. The address I think is 1133 Demere Rd. I do not know the owners. It has been vacant for years. I attached the picture from the county record page. It is one of the oldest on the Island. (i think) My Great Grandparents and grandparents moved to the Island in the 40s. Keep up the good work!!! Glad you enjoyed Southern Soul, but I’m sure you must realize that the island has been destroyed. Nothing left but a bunch of rich fools who don’t give a damn about the island or the birds or even the beach. Heck, could you even find the beach??? I’ll bet if you did you had a hard time finding a seabird or a pod of dolphins playing off the coast or a long line of pelicans………but I’ll wager you did find a ton of old cigarettes all stubbed out in the sand. So sad so sad……….I couldn’t even find my old house when I went down there this past summer……..it’s just gone and there’s a new ugly mcMansion in it’s place………cried for days, won’t ever go back. That’s how it feels, for real. Had no idea that the island is so over developed…we visited for the first time a few years ago and thought it was beautiful. But I can definitely understand being upset…same thing happened to me seeing my hometown in Ohio. Wishing I could have seen the “old” St. Simons! The brisket at Southern Soul is the touchstone. We live in New Jersey and drive to Florida at least once a year, planning our trip around lunch at Southern Soul. Truly a great find…The best we’ve ever had! The barn is in Candler County, Georgia. It’s known as the Rushton Barn, or simply the Big Barn. The road leading to it is Big Barn Road!